As we usher summer out, it's time to bid a fond farewell to those pastel colored polishes that were so popular during the warm summer months. As the cooler temperatures set in and our clothes become heavier, our nail polishes should too. 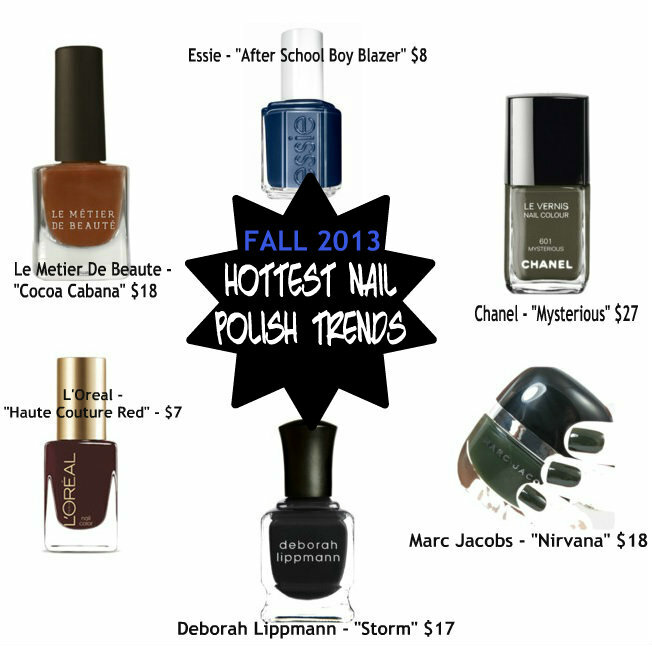 The hottest nail polish colors of 2013 are deep, vibrant, and bold and are the perfect complement to rich colored sweaters and scarves...and my favorite, BOOTS!! Blues - You'll see deep blues in shades of navy and royal blue. Grays - Deep grays will be especially popular, but you'll see light grays too. This gray by Chanel has a hint of green to it giving it a mysterious color just as its name suggests. Greens - Deep emeralds will be extremely popular this fall. Look to pair them with the popular plaid trend. Blacks - Not just for goths anymore, black nail polishes look great when paired with camel colored sweaters and jackets. Reds - Oxblood reds will be in the limelight this fall. Put away your cherry reds and opt for this dark, rich variation instead. Browns - This orange/brown shade screams "Autumn"! It is the quintessential color for the season and is perfect when paired with dark jeans and neutral tops. I am in love with the shade "Nirvana" by Marc Jacobs. I can see myself practically living in that color for most of the fall. How about you? Which nail color do you crave for fall?